It's a very ambitious timeline. Here's how NASA plans to make it happen. It’s no secret that humans (well, at least presidents) are aching to go back to the Moon. And now, we have more concrete plans on how we might do that. Earlier this week, the Human Exploration and Operations Committee for NASA’s Advisory Council presented the most detailed plan to date of how, exactly, it will go about it. In other words, it would act as a basecamp to explore the surface of the Moon, conduct experiments into the viability of prolonged space travel, and prepare for much (much) farther destinations. According to the presentation this week, NASA plans to have the completed Gateway in lunar orbit as soon as 2024 — that is, if everything goes according to plan. “Right now, our near-term focus is the Moon and returning humans there,” Kathryn Hambleton, a NASA spokesperson, tells Futurism. NASA’s teams are planning to use the space beyond Earth’s orbit near the Moon “to build up our technology capabilities, test our systems, and test our operations while we are still a few days from Earth before we are ready to take on the multi-month journey to Mars.” To do all that, though, it needs the Gateway in place. The Power and Propulsion Element (PPE): The component that powers the Gateway and allows it to move to different orbits. The Airlock: A point of exit that could be used for astronaut spacewalks or permit other types of rockets to dock to the Gateway. The Habitat: Pressurized sections of the Gateway that will house up to four crew members for up to 90 day missions. But before astronauts can populate the Gateway, NASA has a lot of work to do. And it’s gotta do it all in the next six years. Step 1: Build a giant rocket called the Space Launch System (SLS). Here’s how it would go. The SLS will launch major components of the Gateway into lunar orbit between now and 2024. In 2024, NASA’s Orion Spacecraft that’s currently in development would nudge those pieces into place, making the Gateway ready for human inhabitants. To send a crew of astronauts all the way to the Gateway, SLS is going to need a rocket capable of sending 37 metric tons (81,000 lbs) of cargo into orbit around the Moon. Right now, we don’t have a rocket that can tow that much — SpaceX’s Falcon Heavy’s max payload to the Moon is estimated to be around 18 to 22 metric tons. Engineers are going to have to figure out how to double that capacity to make the SLS happen. 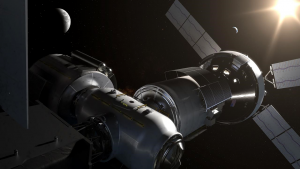 Complete the SLS and the Orion Spacecraft, and find funding for all components of the Gateway, and launch it into lunar orbit, and send the first couple of astronauts there by 2024? Pretty darn ambitious. Especially since so far the SLS’ development hasn’t exactly been smooth sailing. The private space industry might help NASA get there. The space agency is hoping that a private space company will take on the substantial task of developing the lander that Gateway astronauts will use to travel from their habitat to the surface of the Moon, but no official partnership has been announced yet. The Gateway’s doors (or airlock) will be open to rockets launched by both government space agencies and private companies. Since companies like SpaceX are making giant technological leaps — they’re launching rockets that are more powerful and cheaper — they could take a big a big load off of NASA’s back. “There will definitely be opportunities for a variety of rockets to deliver supplies and logistics to the Gateway,” says Hambleton. Even with private space companies on board, NASA will inevitably face some major roadblocks to getting the Gateway up and running. There’s still the inherent risks that astronauts face during deep space travel – intense levels of radiation, isolation, a lack of gravity, and harsh environments. Luckily, NASA’s research is well underway, particularly from studies conducted on the International Space Station. “We are working towards greater reliability of systems and more of a closed-loop kind of system in terms of recycling air and water, so we’re less reliant on Earth for those consumables,” Hambleton tells Futurism. No matter the outcome of these experiments, however, NASA still plans to make the Gateway happen in the stated timeframe. Yes, NASA has a lot of work to do before the Deep Space Gateway is peacefully orbiting the Moon. Six years go by pretty fast, but making things happen in that timeframe is no impossible. With the right public-private partnerships and international collaborations, NASA has a much better shot at getting astronauts back onto the surface of the Moon, and maybe to Mars before we even know it.